Recent rapid advancement in digital technology is already transforming how businesses and the accounting profession work. It is an unstoppable trend and businesses must not ignore the latest trends otherwise risk becoming obsolete. We are organising a complimentary talk in our office to explain further on how smart technologies (e.g. cloud computing, machine learning, artificial intelligence, optical character recognition etc.) is now available to SMEs at an affordable price. These new innovative tools can benefit businesses by providing real-time financial data, converting it to comprehensible information for timely decision-making; automate tedious and repetitive processes, and eliminate duplication of work in business processes. 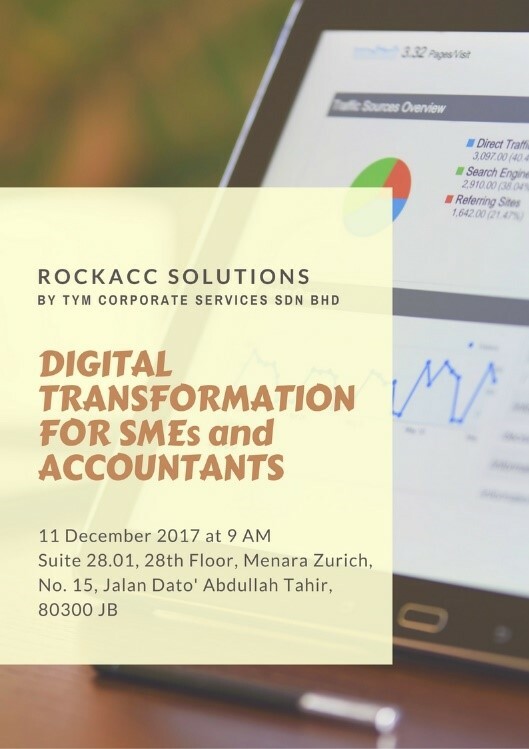 Consequently, this can help SMEs gain an advantage over their competitors, make good business decisions, and discover a new revolutionary way of working with accounting information and your accountant. We have also invited industry experts from leading cloud software in Malaysia to share on the latest trends and their software. Event attendees will be entitled to a special discount voucher*. Grab your seat before they are gone!